Pretend-play tea parties can now include coffee with this realistic wooden Brew & Serve Coffee Set for two! Lift the lid and pop in one of three coffee pods (regular, hazelnut, or mocha) and turn the knob to choose the serving size! Too hot for coffee? Add the included ice cube to make it ""iced."" The 11-piece set comes with two wooden mugs, creamer, sugar, a spoon, and even a re-usable order card for budding baristas! Quality construction means endless hours of imaginative play! The included menu card and extension activity ideas are a springboard for endless skill-building fun. 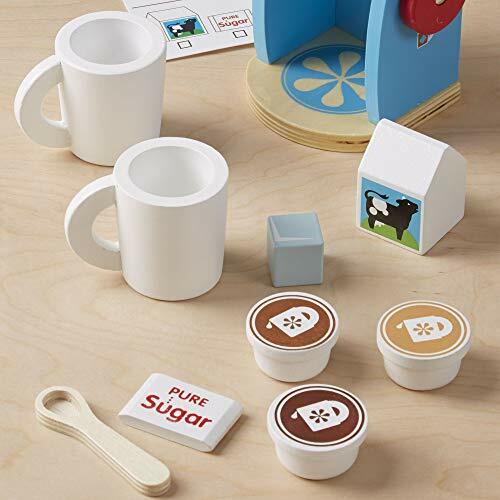 The menu card helps with word recognition and encourages kids to follow directions, and to hone their language and storytelling skills as they imagine opening a coffee shop, making breakfast, or having friends over for coffee. Use the set to talk about concepts of light and dark, and small, medium, and large. With Brew & Serve, there are lots of ways to play and learn! 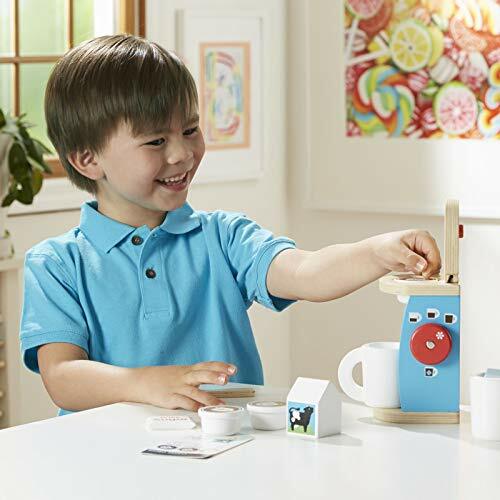 The Melissa & Doug Wooden Brew & Serve Coffee Set makes an ideal gift for kids ages 3 to 6 years. Add the Melissa & Doug Waitress Role Play Costume Set to round out the pretend play experience and to give kids an engaging option for screen-free fun.